Whenever I mention climbing in Jordan, most people are surprised to hear that there is any. Not only is there climbing, if you like big adventuress trad, it may be one of the best destinations in the world. This year was my second trip to Wadi Rum. This vast canyon system has been the location of many Hollywood films, from Lawrence of Arabia to The Martian. The area is made up of large sandstone features rising up from the desert floor. The rock is of variable quality, with most routes including Utah quality hard sandstone and sections where caution must be taken to tread lightly. After landing in Amman, the capital of Jordan, we picked up a hire car and headed south down the Desert Highway towards Rum. Rum is a small Bedouin village in the main Wadi and is the only form of civilisation in the entire area. Along with many other villages, it was built by the government in the 1980s in an attempt to bring the Bedouin in from the desert to integrate into Jordanian society. Little thought was given to style, or the creation of stable jobs in the new villages. Rum has managed to generate an income from tourism with many tourist parties passing through on day visits. Only climbers tend to stay longer. In complete contrast to other venues of this quality, it is not unusual to find you have the region with hundreds of kilometres of climbing entirely to yourself. This was the case during my visit this year. 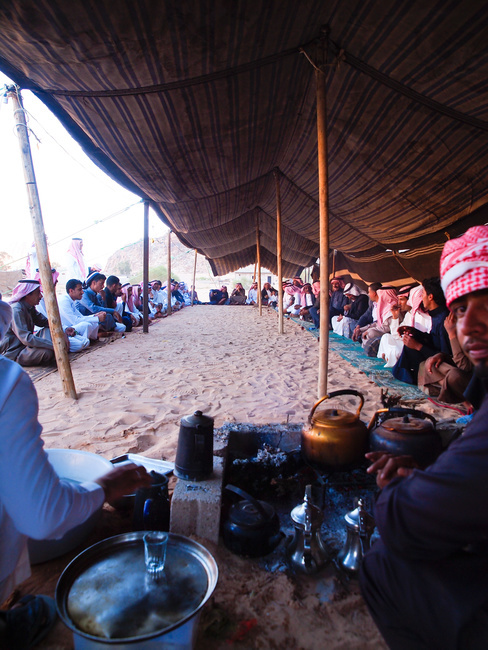 To understand Wadi Rum, you must understand the Bedouin people who live there. They are very traditional and conservative in their social views, normally sprouting long hair and often eyeliner, looking somewhat like an Arab Jack Sparrow. They are both tough and welcoming. During the two weeks we were staying in Rum, we were treated as part of the community, being invited to both an engagement party and a wake. Onto the climbing. The routes are normally between four and ten pitch, but go as high as 30. All routes are graded in French alpine grades, with the bulk of the classics about TD 6b (E2/3 UK). There is a guidebook, but it was published in 1992 and only marginally updated two years later. Some might call it brief and lacking in detail, condensing a 23-pitch route into eight lines of text and a hand drawn sketch, but this only adds to the adventure. When climbing in Rum, expect to be hot, scared and benighted at least once during any trip. The climbs can be split into three categories normal (ish) trad routes; big walls requiring aid and porta ledges; and Bedouin routes. The later of these are traditional Ibex hunting routes that were soloed barefoot by the Bedouin. When attempting these, it is tempting to become overly confident, thinking if the Bedouin carrying an Ibex carcass and rifle can do this, me, a climber armed with modern climbing shoes and ropes, will cruise it. As most of the cruxes are completely unprotected, even with modern gear, it is worth remembering that the Bedouin have one key advantage in these situations, a belief in fate. The normal trad routes consist of perfect desert splitters, face climbing, arêtes and corners. There is such an abundance of quality routes, you will likely stay to the popular routes on a first trip. Popular in Wadi Rum terms means climbed once a year or more. Some of the more adventurous stuff in the guidebook may have never had a second ascent. Be cautious of the grading on these routes. It is essential to spend at least one night camping away from Rum in one of the many Desert Canyons. A Bedouin will drop you off in a 4×4 with food and water and arrange a time to pick you up a day or two later. Here you are truly in the middle of nowhere and completely self-sufficient. Sitting under the stars around a camp fire in the middle of the Arabian Desert after an epic day’s climbing, discussing the plans for adventure the following day is an unforgettable experience. On a rest day there are a few options, but we visited Petra, not from the tourist trail, but from an obscure back entrance. This involved getting a 4×4 to drop us off in the desert near the Israeli border and going on foot from there with only a hand draw sketch map. Once the 4×4 departed, we were left alone in the desert to start our eight-hour trek (assuming we didn’t get lost) across the desert into Petra. Maybe I shouldn’t have called it a rest day after all. Eventually we found the start of a Wadi, which become an oasis with lush greenery, frogs and even crabs. As we continued along, the sides became steeper until we were in a huge canyon with walls towering over a hundred meters above us. Following the loose description and hand drawn maps, we continued through the canyon, scrambling and soloing up to French 4. After a couple of sections of questionable navigation and near peril, we found ourselves in the tourist area of Petra. This is a truly epic day out, in which you never feel entirely safe until the very end. 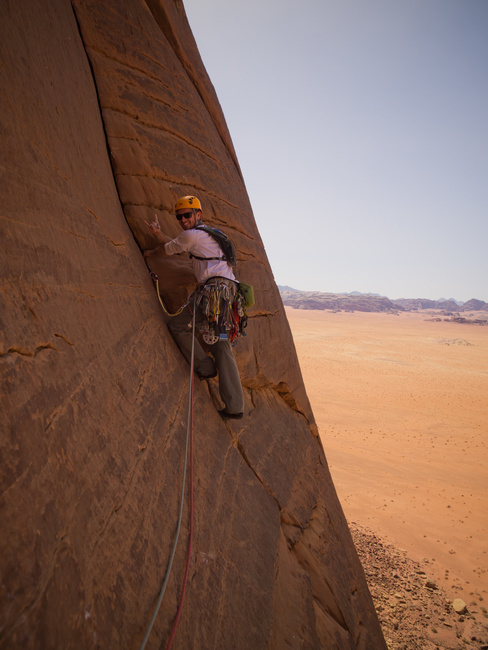 To climb in Wadi Rum, double ropes, two sets of cams and a set of nuts will do you for most routes. To tackle the biggest routes, you will require full big wall kit as in Yosemite. Camping or dorm accommodation can be arranged on arrival. Rum village sells all the basic supplies you will need in a small corner shop (except booze). 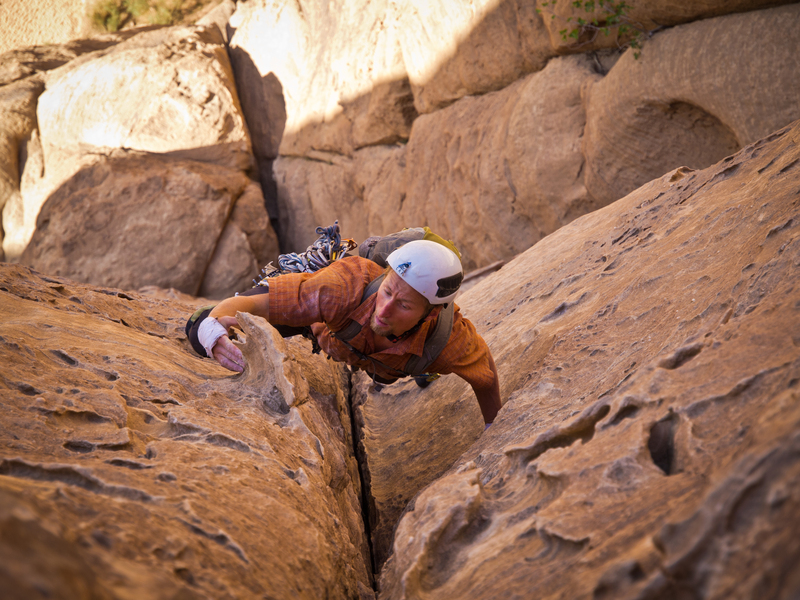 Wadi Rum should be on the tick list of any trad climber who likes a bit of adventure. 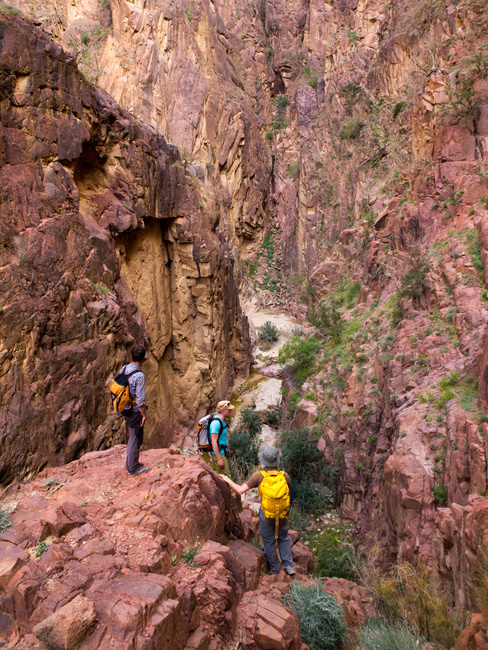 Hearing the call to prayer echo through vast canyon walls as you tackle the crux on pitch 10, hundreds of meters off the desert floor is something that must be experienced to fully appreciate.